How ironic you might say that. Here's something similar i posted yesterday and this morning on another thread. Alot of feel good stories circulating about our club at the moment. Fight Hard Tigers, Fight Hard. Tiger supporters on the same wave length ? Who would have thunk it ? Something special has started to happen fellow Tiger fans. great game glad we pumped them in the end. I was at the game and couldnt find a single negative in any player. Rance played a solid game, apart from that kick on the full right in front of us but hey mistakes happen Jackson made at least 3 today and dusty a few also. He is at times clumsy and sometimes rushes his decisions but we need to persist. I've always liked Rance but I watched him closely today and I was very frustrated. His endeavour and persistance are without question. His guts and determination are exeptional traits BUT it's his undisciplined acts that disturb me. The kid has still only played under 30 games, is holding down a key defensive spot along side a bloke with only 6 games to his name. He's improved massively this year and can't be expected to win every contest and not make a single mistake, especially at his level of development. look like I said I've always liked him but it was his fundamental basic errors. His spoil late in the game was fantastic. But he did cost us 3 goals from very basic fundamental errors though. I really hope he turns out to be as good as a young geelong recruit that was maligned by their supporters week after week in his early years.... That was a young Scarlett who became an all austalian defender and a champion full back. I really hope he can be that good..... But he got a long way to go. He is not a scarlett type and will never be. His development thus far reminds me of Ben Reid from collingwood. I think he could be a Scarlett type, not completely but he is even more attacking than he is, around the same height, etc. Potentially a mix of Scarlett & Chad Cornes. Needs to improve to get to that level, but his stats for his 4 matches this year are. Other than the Roos game where he was rusty in the first half, he's been very good this year. For comparison with some other tall defenders, Sam Gilbert has 74 disposals and 23 clangers & Jackson Trengove has 104 disposals with 20 clangers. Rance's 80 disposals and 10 clangers from 4 games is pretty good for such a young kid. I know nothing about football, nothing what soever. I thought it was a real "rumble in the jungle" for 3 quarters. Awesome effort to steam roll them with 9 of the last 10 goals. (2) Conca and Batchelor look like they have already played 50 games. (3) Found a player in young Grimes. Ditto Rance. (4) Yesterdays effort was an even team performance. 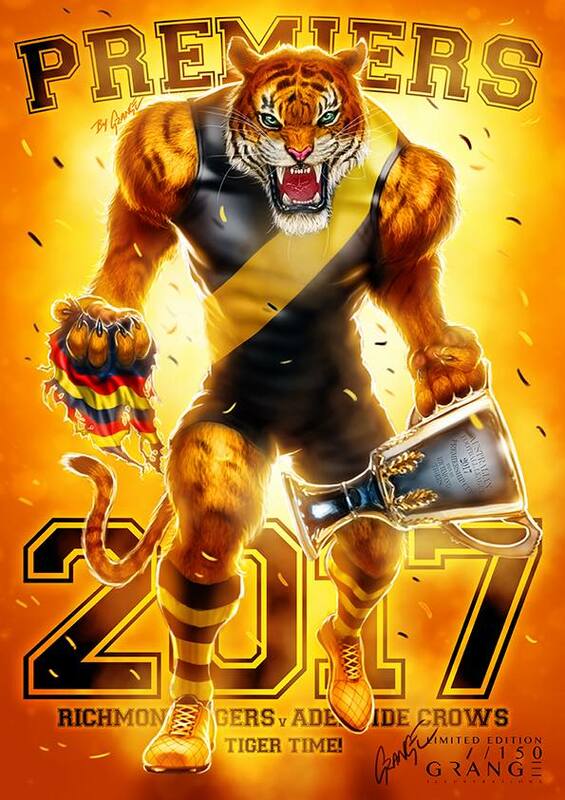 Living in Perth I recieve my fair share of mockery for being a passionate Richmond supporter. My "Docker" friends and family members all seem to have gone into hiding. Grimes needs to develop abit of run to his game. The spoil is great, but we dont need just a spoil, his development must mean that he can run off his opponent and create some opportunity. Hopefully this comes with experience. Nevertheless he has made a good start to his career. Yes Hampson has taken a mark! It was fantastic to see our efficiency stats at 81%. Haven't seen it that high in quite some time. The Dogs were Pooh against the Swans and their forward line is running very ordinary at the moment. If it weren't for guys like Griffin & Boyd, they'd be in even deeper pooh. On last nights form I reckon we are in good shape for another upset! Grimes needs to develop abit of run to his game. He does, when he gets it, everything seems to come to a stand still. Luckily his skills are tidy enough to hit a target. Against logic there is no armour like ignorance. Does anyone else have great difficulty understanding anything that comes out of Mark Harvey's mouth? The only time i understand him is when he says "thunderbirds ARE GO!"